Burn out. Two words no one wants to hear but we all must succumb too eventually. Anyone who has been burnt out will tell you it occurs when you’re at the end of your rope. Your body is exhausted, your mind is exhausted, and you’re entire being refuses to get up and function. At its best we break down and it takes us out of work for a few weeks. At its worse, burn out is totally debilitating, and can cause long-term of permanent illness. Are you becoming burnt out? Take a look at our checklist, and if you tick the box on three or more of the following indicators, you could be headed towards burn out. That means one thing: you need to stop and rest. If once-enjoyable activities have become chores, waking up has become an ordeal, and you just feel ‘bleh,’ you could on the road to burn out. Our bodies will often shown signs of exhaustion before we accept the reality of it ourselves. Lethargy can occur for a number of reasons, so see your GP for a diagnosis. If your schedule is full, you never take a sick day, and you’re always focused on the next thing you ‘have’ to do, your body will eventually stop functioning in protest. Start setting aside time for you, and don’t be afraid to create space in your day when you have nothing to do. It’s great to help out our friends and family, and wonderful to do the things we love. But if you feel pressure to say ‘yes’ every time someone asks for a favour, you’re on a one-way street to burn out. Remember, saying ‘no’ to something can mean a bigger ‘yes’ to others—including yourself. If you’ve put off seeing the GP or avoid seeing a counsellor or psychologist when you have the niggling feeling you need too, there’s a good chance you’re in denial about your body or mind’s condition. Ask a friend to help you make an appointment and keep it. You may just save yourself from extreme burn out. 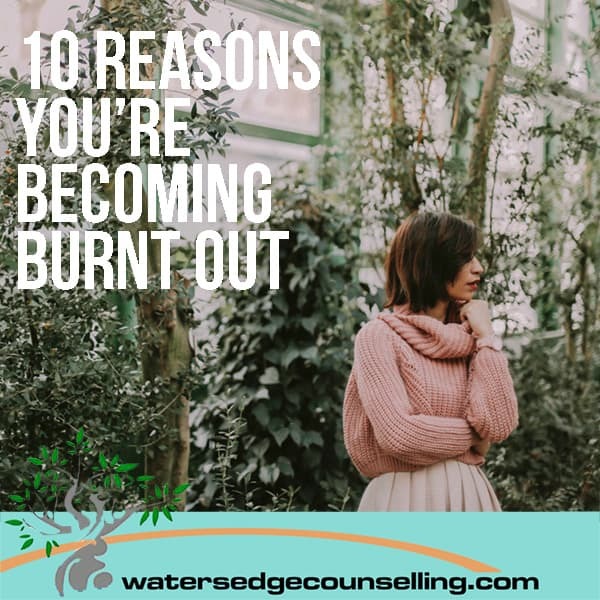 If you feel anxious about situations that never used to trouble you, live in a constant state of perpetual anxiety or have panic attacks, these are indicators that your body could be getting burnt out. If this is you, talk to a counsellor about your physical, emotional and mental well-being. If meal preparation is a thing of the past and you live off fast food or frozen meals, you’re time poor and probably very stressed: two indicators you’re on your way to burn out. Start making healthy eating a priority again, and your body will start to heal. It’s highly likely you’re an active person who is always on their feet, but if you struggle to set aside time to exercise, your body is suffering. Go running, sign up at the gym, play sport, do Pilates, try yoga or take the dog for a walk. Just set aside time three times a week to care for your body. You may see your family every night and your friends at work, but if you haven’t spent time with them outside of these everyday scenarios in awhile, you could be too caught up in your schedule and routine—a potential route to burn out. Leisure time with the people we love is good for our emotional wellbeing, so make time for it. If you’re stressed about work, stressed about your relationships, stressed about your diet and stressed about feeling stressed—you’re close to burn out. A high heart rate, sweaty palms and tense muscles means your body is in fight or flight mode. This leads to frequent illness, muscle spasms and depression. Making time for meditation, a walk or a nap is a good way to start de-stressing your life. If you’re feeling stressed about the time you need to make for self care, and tense up at the thought of re-arranging your schedule, there’s a good chance you’re close to burn out. It is difficult to stop, but it is harder to recover from burn out. And as capable as you may be, no one is exempt from it. So make the decision to stop and rest. Are you becoming burnt out? Do you struggle to rest? Here’s what you need to do: contact Colleen on 0434 337 245 or Duncan on 0434 331 243 for a FREE 10-minute phone consultation on how we can best help you, or press book now to book in our online diary.